Congratulating the two cities on the anniversary, Consul General Zhao pointed out that Nanjing and St. Louis were great pioneers in the development of China-US sub-national relations by establishing the first sister-city relationship in November 1979, only 10 months after the establishment of China-US diplomatic ties. 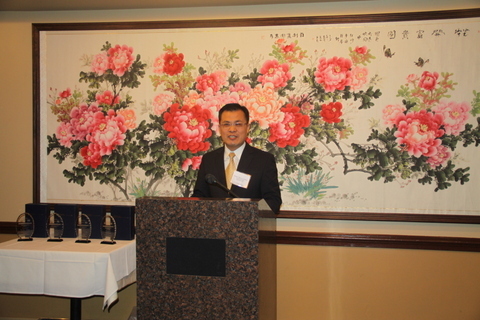 Consul General Zhao also congratulated the two cities on winning the "longest US-China Sister City Relationship" award at last month's 2014 China-US Sister-City Conference to Nanjing and St. Louis, saying it is "the honor the two cities obviously deserve", for "their contribution is indeed unique and historic". He expressed appreciation to the municipal government officials and friends from all walks of life for their longtime commitment to developing the sister-city relationship, including the incumbent and former mayors of St. Louis. The Consul General also underlined the strategic significance of sister city relationships on the development of China-US relations. "More exchanges and cooperation at the sub-national level will certainly play a unique role in fostering the mutual understanding and friendship between our two peoples, which will in turn solidify the foundation of the development of China-US relations," he said. 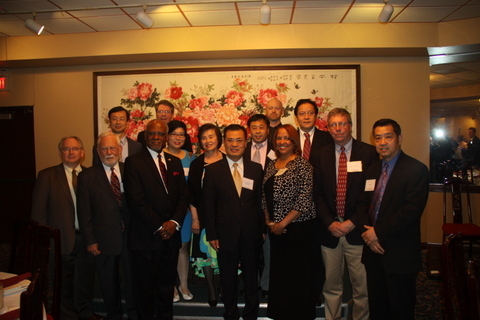 Nearly 100 guests from various circles in and around the city attended the celebration dinner hosted by the St. Louis-Nanjing Sister City Committee. They included County Executive Dooley, Representative of Mayor Ms. Cambell-Jones, and former Mayors Conway and Schoemehl.